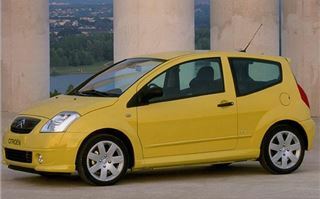 In theory the Citroen C2 is a new AX. Small, light, simple, practical, economical and fun. But car makers can’t make a car like that any more. Laws don’t let them. 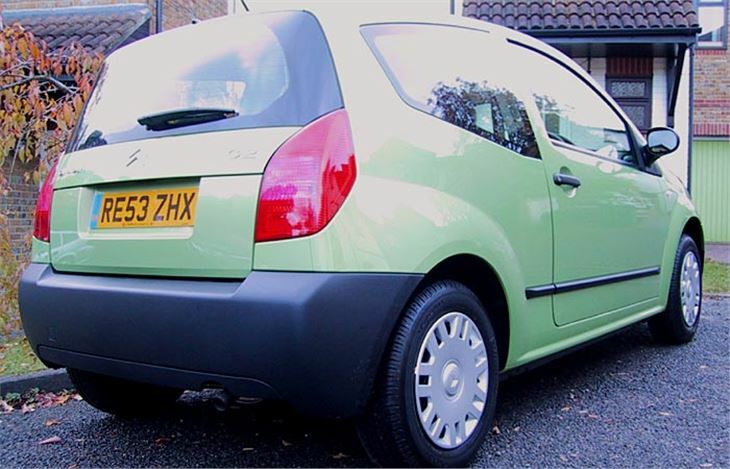 So underneath its cute little body the C2 has had to become a lot more sophisticated. You get the flavour by looking at the spec. Power steering. Central locking. Airbags all over the place. And under the skin a rock solid passenger compartment with crumple zones either end. It’s a miracle they managed to keep the weight down to 932 kilos. And the economy up to a remarkable 69mpg combined for the diesel version. For low running costs, with £85 a year VED and Group 2 insurance you’re going to find that very hard to beat. 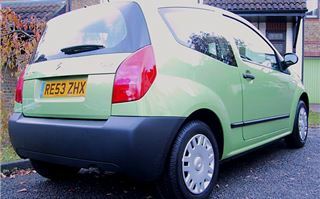 But I decided to look at the C2 as a first car for a 17 year old. 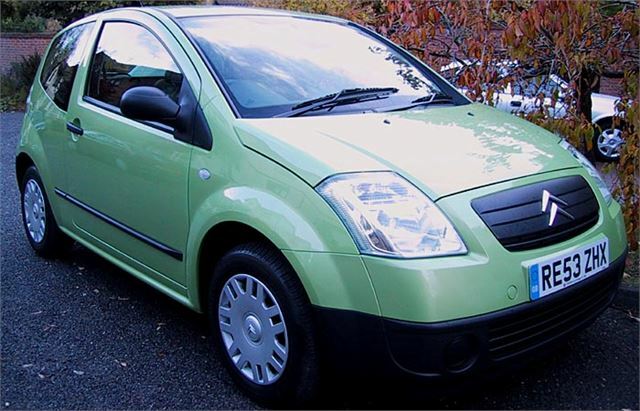 That means either the bare bones Group 1 insurance, 48mpg 1.1L, at £6,995 as an introductory offer. 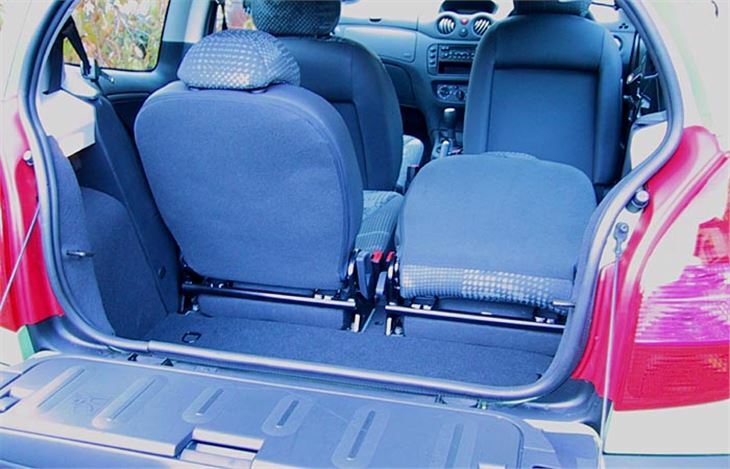 Or the LX which comes with independently sliding and folding rear seats and other goodies, including a CD player, which add up to an extra £500. So, actually, most buyers are going to fork that extra £500. Brave of Citroen to put me in the bare bones £6,995 L, though. Novel to have to wind the windows up and down and twiddle the door mirror control stalks instead of pressing buttons. But you’re not faced with bare metal poverty spec that was all you used to get in a base model. The finish is quite good. There are vanity mirrors, a speedo rim digital rev counter, a decent enough radio, a height and reach adjustable steering wheel, a switchable passenger airbag, remote central locking, self locking doors, automatic hazards. Have a look at the full list below. The rear window lifts up, hatchback style, for dropping supermarket bags into boot space which is reasonable for the car’s length. But the drop-down tailgate is only half a tailgate, leaving a substantial strengthening sill. 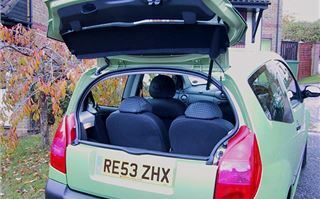 And on top of that, merely the backrests of the rear seats fold down. Since they don’t slide, there really isn’t much legroom in the back. Get a spanner and you could howk them out completely, which might suit some people wanting a commodious two seater. 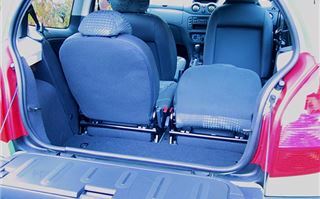 The back seats alone are a good reason for coughing up the extra £500 for the LX. Out on the road, the car goes well enough and actually started to go a lot better as it began to loosen up. Handling felt inert at first but soon became much more fun once we got used to each other, even though the steering is still a tad light. Clutch, gearchange and throttle response are just about as good as they could be. It pulls about 20mph per 1,000rpm in top and will scoot along the motorway in the mid 80s very happily. Obviously it’s a bit noisy at 4,000rpm plus, but not wearingly bad. And here's something you don't expect in a base version. It wasn't on the spec sheet. But on the dash there's a convenient button that allows you to set a speed warning. Exceed the pre-set speed and you get beeped. So no excuses and no need to constantly watch the speed rather than the road when driving through a restricted area. When the time came to part I actually felt some affection for this cute little car. If I had to, I could live with it and enjoy its company immensely. 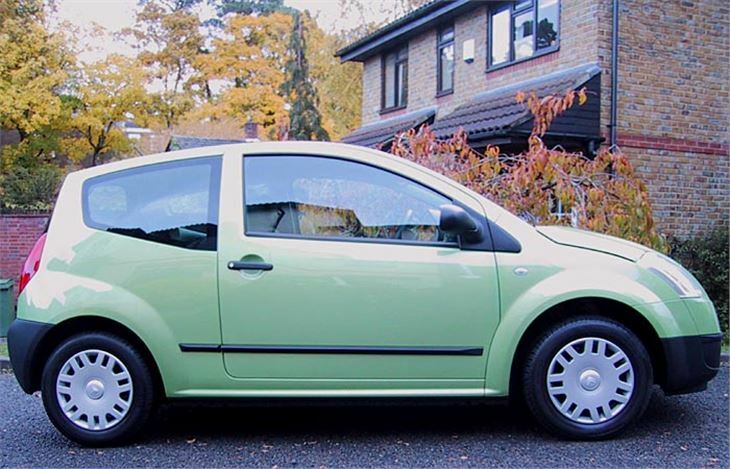 I can imagine quite a few wealthy parents indulging their 17 year old offspring with a C2, then borrowing it more often than they ever expected.